The NFL typically issues their compensatory picks to the clubs in late March at the owners’ meetings, but the experts out in cyberspace, who have largely cracked the league’s unpublicized formula for awarding compensatory selections in the draft, and accurately predict what teams will get extra picks, don’t see the Bills getting anything additional this spring. Recently on Philly.com, compensatory pick prognosticator Jimmy Kempski forecast how the league will award these picks and to which clubs. Based on his projections the Bills will not be awarded any compensatory picks. One of the main reasons why is a team, first and foremost, must have a net loss of free agents from the previous offseason. Based on past history there are several free agents who do not fall under the “net loss” formula. An example would be restricted free agents or exclusive rights free agents who are not tendered by their teams, like David Nelson last year. So based on those stipulations the Bills broke even on free agents, losing Andy Levitre and Chad Rinehart, while signing Alan Branch and Manny Lawson. Kevin Kolb does not count because he was released by Arizona and not an unrestricted free agent. The league only awards 32 total compensatory picks a year in the draft. If there has not been enough player movement to warrant the full 32 compensatory picks in that fashion, the rest are awarded as net value picks, usually to teams who lost a free agent that signed for top 10 money at their position. Such would be the case for the Bills with Andy Levitre, who signed for big money in Tennessee last year. However, with a high rate of player movement last year in free agency these projections indicate that every single compensatory pick this year will be awarded to teams that experienced a net loss in free agents. So teams like Buffalo (with Levitre) and Oakland (with Phillip Wheeler) would not receive a seventh round compensatory as a net value pick. Their projection list is below with Pittsburgh and Green Bay the only clubs forecast to land picks at the end of the round three, the highest round in which a compensatory selection is given. 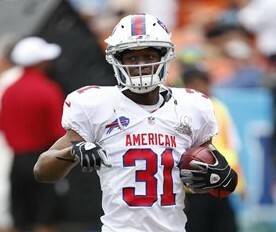 Don’t forget to check in on our Senior Bowl coverage all next week on Buffalobills.com. Here’s the latest edition of your questions on email at AskChris@bills.nfl.net and on Twitter @ChrisBrownBills. Well, another year like all years. Just wait fans, we have something started here!!! Marrone’s first mistake will be not letting Hackett go. As I have said previously, loyalty is Marrone’s achilles heel. He won’t know how to “can” Hackett so we are stuck with him. What really stinks is that another year has slipped away and this team still has multiple problems to address. Where do we even start with the next draft? Please don’t draft another Alabama player! We let players like Levitre sign elsewhere and then we say we need to address our weakness at offensive line. Does this make any sense? It is just one wasted draft choice after another on positions we could have fixed with players already selected. When is this team going to address an age old problem at the tight end position? Successful teams have tight ends who stretch the field. When are the Bills joining the 21st century? Sad leadership to say the least. I won’t even get started on the QB position. CB: Jim, I respect the frustration. You fans have waited a while for a winner, but regarding your question on losing Levitre in free agency, keeping a player at a non-priority position at what would’ve been an exorbitant price ($8M plus a season) was unrealistic. Tennessee chose to spend big money on their offensive line and where did it get them? They ranked 22nd in offense, 14th in rushing and 21st in passing. They were 19th in scoring. As coach Marrone said recently guard is position where you can develop a player into a competent to strong contributor. Offensive tackle and center are where you need the bona fide stars. As for the tight end position, I think the new staff with GM Doug Whaley is looking to address the need for more athleticism at that spot. Tony Moeaki and Chris Gragg were the first steps in that direction. We’ll see where it goes this offseason. Concerning your criticism of Hackett I think it’s misguided. Hackett had to curtail the variety and tempo of his offense to accommodate not one, but three “green” quarterbacks over the course of the year who were all spending their first year in his offensive system. Circumstances compromised his talent for calling plays. I’m confident the offense will expand and diversify considerably next season. As always, thanks again for being a great source of Buffalo Bills information. We appreciate your feedback. Can you explain the recent signings of 7 players to reserve/future contracts? The team moved quickly to sign these 7 right after the end of the regular season. What is this type of contract? CB: Those contracts are typically reserved for players who were on a team’s practice squad during the regular season. If the team would like to keep those players on the roster through the offseason they must be signed to a reserve/future contract. If memory serves they have a week from when their season ends to sign their practice squad players otherwise they’re free to be signed away by other clubs. Essentially players that the club believes can still be developed into something more are signed to these kinds of contracts, which are modest in nature. With the release of WRs coach Ike Hilliard, would the Bills seriously consider bringing in Andre Reed to take over as WR coach ? I think Reed would be a great choice. Andre had great work ethic in Buffalo and was as tough as they come running routes over the middle. CB: While I do not debate the qualities you described of Andre Reed’s game, it’s hard to say it’s a move that will be made. His coaching resume is very, very short though he is coaching in the NFLPA bowl on Saturday. I get the sense that coach Marrone wants someone with a more lengthy coaching background. I was looking at wide receiver free agents for this year, and I see that Eric Decker from the Broncos is a free agent after the playoffs. Would the Buffalo Bills pursue Decker and possibly make an offer? CB: Yes, Decker is scheduled to become a free agent. I don’t think there’s any question that the Bills have already demonstrated a concerted effort to add size at the receiver position with the reserve/future signings of Ramses Barden (6’6”) and Chris Summers (6’4 ½”). But they need a proven answer with size at receiver. Decker is certainly a proven player, but I think they want the big receiver on their offense to also be a bona fide number one target. I don’t know that Decker can be that. I feel that a lot of his production is a byproduct of the fact that opponents scheme to limit DeMaryius Thomas and Wes Welker and Decker becomes the beneficiary. Without a similar supporting cast, I’m not sure what you could count on with Decker in terms of production. CB: While I understand your frustration in seeing talent flourish elsewhere instead of on Buffalo’s roster, your Bills history is a bit cloudy. The team wanted to keep Jason Peters and were willing to renegotiate his contract, which had two years left on it, but after he held out and then threatened to hold out again the next season it was clear that keeping Peters in Buffalo was going to be monumentally difficult. So he was traded to Philadelphia for a first, fourth and sixth-round pick. When you have a player that doesn’t want to play for your team it’s hard to even make them happy with more money. As for Karlos Dansby the Bills brought him in on a free agent visit so to indicate the front office thought he was washed up is just wrong. He chose to look elsewhere to sign essentially using Buffalo to drive up the market price for his services. Both have been accomplished players, but if they don’t want to be here you’re not going to win with them on your roster. Time for the latest edition of your questions from AskChris@bills.nfl.net and on Twitter @ChrisBrownBills. I don’t see how anybody can say that the Bills are good on the offensive line. The loss of Levitre left a gaping hole there. RT is a question mark, since Pears was injured all last year, and Eric Wood seems like he might be injury prone. CB: I think your concerns about left guard are legitimate, but beyond that Buffalo has capable players for the starting roles and depth behind them. At tackle you have Cordy Glenn on the left and Chris Hairston on the right. Erik Pears is still limited, but when healthy more than capable himself on the right side. Kraig Urbik is your right guard with Wood in the pivot. Depth-wise you have Zebrie Sanders as a tackle guard option once healthy. Beyond that it is a green group in terms of playing experience, but that’s the case for most of the league. With the new high tempo offense, can we expect Doug Marrone to try to take a lead by choosing to receive this year? CB: I’ll have to ask him about that to be sure, but most NFL head coaches have found that the research shows if you choose to defer you typically wind up with the last possession of the first half. Obviously by deferring you also get the first possession of the second half. Those back-to-back possessions are seen as valuable in the eyes of many coaches. However, if your defense is substandard it might be wiser to choose to receive first if you win the toss. I’ll see if we can get an answer on coach Marrone’s philosophy on that. Now that the draft is over and we still need some positional fills, who do you think the Bills will go after in FA to fill those voids (like OL, LB, CB)? CB: I think cornerback could prove to be the most pressing need. Buffalo has some interesting young talent at corner among the undrafteds, but there’s already a good deal of youth at the position. I wouldn’t be surprised if they added a veteran to that group at some point. My questions are about Brad Smith, I have heard he has looked good this spring as a WR. Is this his only role now or could he still be a wildcat/#3 game day QB? Will coach Marrone even employ the wildcat? If not could Smith be on the trade block at some point this off season? Either way I wish him the best the coming season. He’s a real asset as a triple threat and that seems to be something this new staff seems to value. I hope to hear from you soon on this as I’m sure I’m not the only fan to be wondering about Brads future here. As always GO BILLS!!! CB: Yes, Brad Smith is strictly a receiver and a return man at this point. Based on coach Marrone’s comment on the Wildcat after the draft, I highly doubt we’ll see it as any respectable part of Buffalo’s offense. Smith to his credit has performed well in OTA practices. He and T.J. Graham have probably benefited the most from the absence of Stevie Johnson on the practice field. As for the trade block, I think we’re a bit ahead of the game at this point. There’s a lot of evaluation that needs to be done by this coaching staff. Firstly, thank you for your coverage. As a Bills fan since 1986 living on the other side of the world, I am more than appreciative of all informed coverage. Two quick questions: have the Bills had talks with Brandon Moore. if not, why not? Secondly, it is all but impossible to follow college football from here. However, I have watched Keith Pough’s highlights. Admittedly, highlights can be very misleading, but he looked terrific. Why was he not drafted? What chance does he have of making the team? CB: Thanks for the kind words. To my knowledge the Bills have not talked to Brandon Moore. Obviously, Bills head coach Doug Marrone knows him extremely well. He was the Jets assistant offensive line coach, who turned him from a defensive lineman to a very successful guard on the offensive side. So there’s a relationship there. At age 33, he’s probably not what the Bills are looking for knowing they want to build this roster from the ground up with players that will be here for the long haul. However, if they do not like what they feel they are getting from the guard spot you can’t rule out the Bills making a phone call to the veteran. As for Keith Pough, he’s a bit undersized and did not perform well at the Combine, especially when it came to his 40 time (4.87). He also played at a lower level of college competition at Howard. That doesn’t mean he can’t make an NFL roster, but it discourages NFL clubs from taking a chance on him with a draft choice. Signing him as an undrafted offers less risk. I do know that the Bills are high on him among their undrafted group. The original reports of Andy Levitre’s new contract with the Tennessee Titans were inaccurate. He’s actually going to make even more with the Titans. Original reports had the contract at five years and $39M, but the latest report has the contract lasting six years for $46.8M deal. That according to the Tennessean’s Jim Wyatt. The deal for Andy Levitre with the #Titans is for 6 years, and worth $46.8 million. The deal averages $7.8M per season. It’s not a surprising report, but with the start of free agency an hour away ESPN is reporting that Bills free agent guard Andy Levitre is a long shot to re-sign with the Bills. ESPN AFC East blogger James Walker tweeted as much about Levitre’s future. With a handful of NFL clubs desperate for interior line help like Chicago and San Diego there’s enough demand that will likely pay Levitre handsomely. With the negotiating window now entering day 2 reports are circulating about the number of teams in pursuit of Bills impending free agent guard Andy Levitre. According to a report by the Tennessean the Tennessee Titans are in pursuit of Levitre with additional reports suggesting the San Diego Chargers and Chicago Bears have also expressed interest. Indianapolis has been mentioned as a team interested in Levitre’s services too. Naturally the Bills are also still vying to retain Levitre before he hits the free agent market officially on Tuesday afternoon. The Chargers interest, which was reported by San Diego Union-Tribune reporter Kevin Acee makes sense for a couple of reasons. “@utu3: Bolts pursuing Levitre? Would be nice fit next to Fisher.” >So u see them trading up too? They have expressed interest in Levitre. Levitre is a native of Santa Cruz, CA and the Chargers also employ Bills former offensive line coach Joe D’Alessandris as their new offensive line coach under new head coach Mike McCoy. D’Alessandris served in the same capacity under former Bills head coach Chan Gailey. The Bills aren’t the only team with a starting guard that’s an impending free agent. The Washington Redskins had one in Cory Lichtensteiger, but he’s reportedly agreed to terms and will re-sign with the club. According to the Washington Post it’s a five-year deal for Lichtensteiger, who is considered an average guard and not the caliber of Buffalo’s Andy Levitre. It’s hard to say whether the deal for Lichtensteiger helps to provide a stabilizing market number for guards knowing Levitre is likely to be the highest-paid guard of the bunch this offseason. SI.com’s Peter King has put out his top 50 NFL free agents list for the impending market, which opens Tuesday afternoon. And he’s got Bills free agent guard Andy Levitre in his top 5 overall. King has Levitre ranked as the fourth-best free agent player and top offensive lineman. Here was his assessment of Levitre. He’s played all five positions on the line, and he’s a great team guy. Solid, solid. King isn’t the first to speculate that Indianapolis will be very interested in Levitre. The Colts are looking to solidify the line for their franchise quarterback. Bills GM Buddy Nix shared his thoughts on the team’s own free agents while out at the NFL Combine. Though Jairus Byrd and Andy Levitre are likely high priorities, in a perfect world he’d like to re-sign them all. In a morning appearance on WGR Sportsradio 550, Nix stated a desire to keep all of their free agents including CB Leodis McKelvin. “Leodis is a guy we’d like to keep,” said Nix. And while re-signing all of their unrestricted free agents would be fine with Nix, he also realizes that may not happen. Andy Levitre is a pretty humble player. He’s supremely confident in his abilities and believes his game is better now than it was two years ago, when it was still pretty good. But Levitre, who discussed his free agency in Bills Focus today, is far from satisfied with his personal game. Levitre admitted that Eric Wood has already been recruiting him to re-sign with the Bills. They also share the same agent. There are a handful of Bills players that were selected for the ProFootballFocus all AFC East team. Their choices were the ones most would expect. Here’s who appeared on their squad and what PFF wrote about them. It wasn’t his fault he received only 207 carries. However, he can take full responsibility for making the most of those carries, ending the year with a league leading 94.6 Elusive Rating after forcing 66 missed tackles from his 250 touches of the ball. We wanted to put a fullback in here, but there really wasn’t one in this division that either played enough, or played well enough. That made life a lot easier for us, going with Hartline and Johnson, with Welker working from the slot. All three ranked in our Top 30 for receiving grades by wide outs, and each of them put in a 1,000 yard season. There was a legitimate case for both Richie Incognito and Logan Mankins here. As good as Levitre was in pass protection (and he was very good), he really failed to consistently get much movement in the run game. In the end though, his competition just didn’t do enough to oust him. At right guard, Moore finished the season playing as well as any lineman, ending the year our third ranked right guard. A controversial decision here with Vince Wilfork missing out. While he was dominant at times, there weren’t many games Williams or Wilkerson didn’t have their way with interior linemen. The more complete player of the two is the Bill, whose relentless play results in plenty of pressure (45 quarterback disruptions, ranking third among all defensive tackles). Wilkerson plays as a defensive end for the Jets in their 3-4 alignment, but the way he can get off interior blocks is something to behold. He had 46 defensive stops in the run game, second among all defensive linemen. Byrd is going to be paid a lot of money, and very soon. There aren’t many ballhawking safeties like the Bill, who has the kind of range that should scare quarterbacks for years to come. He had our highest coverage grade of all safeties and was ranked second overall this year. That’s one spot above Jones, who missed too many tackles in the second half of the year, but became a real playmaker for Miami. It could very easily have been Marcus Thigpen, with the two men one and two in our returner rankings.